Labeled as the “rock stars” of the free-thought movement, ‘The Unbelievers’ follows Richard Dawkins and Lawrence Krauss as they make their journey from city to city around the world giving talks, participating in debates, and spreading the importance of skepticism and scientific literacy. Combined with a number of celebrity interviews and talk snippets from a number of well-known speakers and authors, this film demonstrates why it’s so necessary to discuss the importance of religion in a world which no longer needs it. Apart from the efforts of Krauss and Dawkins, this film shows a personal sides of these men we may not be very familiar with. 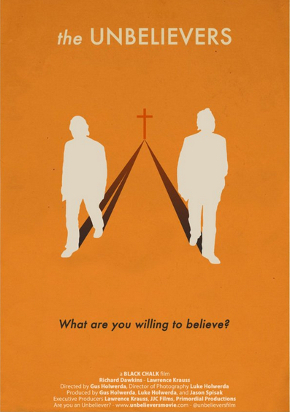 Most of us within the atheist movement rarely develop a personal relationship with intellectual figures such as these; this movie offers that opportunity to everyone who decides to watch all 77 minutes of the film. I’ve said before this movie presents many talks most have watched on YouTube, but they’re shown in a provocative and unique way. Science is more beneficial than people may think, so in a world dominated by religious dogma we need to take a step back and recognize why we must progress in an honest and evidence-based fashion; something those within the scientific community strive to achieve. For a closer look into the motivation behind the works of Krauss and Dawkins (as well as anyone whose sentiments align with the free-thought movement) this movie is certainly for you. Hats off to Lawrence Krauss, Richard Dawkins, and Gus Holwerda and his crew. Brilliant work. Saw it over the weekend, and it was enjoyable. I’ve watched many of Dawkins and Krauss’s youtube videos, so I didn’t learn too much. But still, was good.